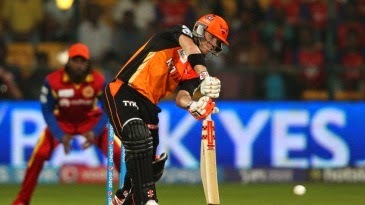 Half-centuries from David Warner and Shikhar Dhawan laid the platform for Sunrisers Hyderabad to cruise to a target of 167 and pick up their first win of the season. They were aided by a dewy outfield, but Royal Challengers Bangalore would have known their total was never going to be good enough to test Sunrisers on a flat Chinnaswamy Stadium pitch. Having been sent in, Royal Challengers were 93 for 2 in the 12th over of their innings, with Virat Kohli batting on 41, when two wickets in two balls from Ravi Bopara precipitated a slide that saw them lose their last eight wickets for 73 runs.